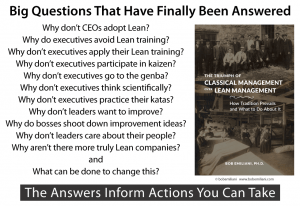 Is Lean Too Arrogant to Save Itself? Time has proven that the central problem with Lean management is that most senior leaders are not interested in it. They have many other ways to achieve their business goals without needing to think about Lean. Relatedly, sooner or later Lean always loses out to Classical management. Despite these two structural problems, Lean remains important because its widespread practice can help deliver a better future for humanity. For many years I have worked the problem of executive disinterest in Lean management from numerous different directions. However, it is only within the last year that I have achieved significant breakthroughs (read here and here). But, is it in Lean’s interest to recognize these breakthroughs? Or, is Lean better off trundling along with the simplistic hope of better days to come? With respect to item 1, you have to ask yourself, “Why aren’t they interested?” It seems there would be much for them and others to gain. Or, perhaps there is much to lose. Who knows? With respect to item 2, one of the principal teachings of Lean is problem-solving. 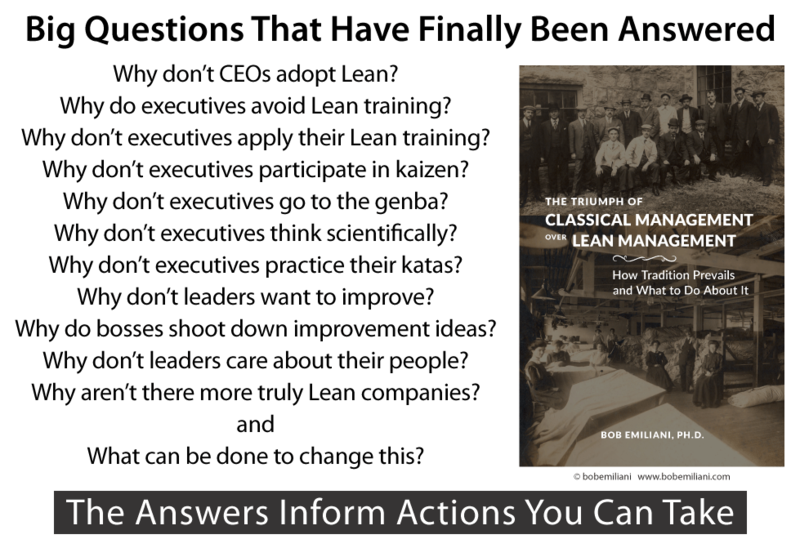 Why are followers waiting for solutions from Lean movement leaders? Some time ago I challenged both Lean movement leaders and followers in LinkedIn to complete an A3 that described a version of the executive resistance to Lean problem (click here to view the A3). There were no takers. Are Lean people happier not knowing the causes of the executive resistance to Lean problem, or its potential solutions? With respect to item 3, Toyota managers may not care much about this problem beyond their own needs and interests. Alternatively, the problem may be of great interest to them as it relates to Toyota’s corporate social responsibility policy, but have not yet been able to solve it themselves. This situation reminds me of old economic concepts that have long been refuted by mountains of evidence (or by simple logic), but which many prominent economists today continue to believe. By doing this, intentionally or not, they engage in “problem unsolving” — ensuring that an important problem remains perpetually “unsolved.” Why do they do that if they claim economics to be a science? Well, economics is actually a social science, and so the act of perpetual “problem unsolving” is a response to achieving a desired political or social need or outcome — for example, to maintain the status quo and avoid disrupting vested interests. With that comes a clear arrogance directed towards avoiding the facts. Could the same be true of Lean? Is “problem unsolving” important for political or social reasons; to help maintain the status quo and avoid the disruption of vested interests? Remember, Lean, like economics (and business), is a social science that claims to be suffused with scientific thinking and the scientific method. Yet, if the problem of executive disinterest in Lean has been solved (or largely solved), but “problem unsolving” continues, then there too exists an arrogance directed towards avoiding the facts. We Lean promoters like to say things such as: “We can show leaders how to raise their business and leadership to the next level.” We assume that executive want to get to the next level. That may not be true. Alternatively, if they do want to get to the next level, they have long had numerous ways to get there that do not include Lean. In other words, the need for Lean may not exist among executives the way we think the need exists. It is now clear that we have overestimated the need by a wide margin. The message of my most recent work is that solutions do not lie in doing more of the same in the future as what has been done in the past — more communication (more books, videos, articles, podcasts, webinars, etc. ), more examples of Lean success, more conferences, more marketing, etc. Preconceptions must be abandoned, otherwise, it could well be that we don’t have a chance for achieving success much greater than what has already been achieved. Neither Lean movement leaders nor Lean followers can be happy to just trundle along and hope for better days. As the image above shows, many important questions have now finally been answered, so there is no need to keep asking those same questions. The next step is to identify practical countermeasures and try them out. At the same time, the Lean community must also recognize that the best evidence to-date informs us that the CEOs who truly desire a Lean transformation, and who can accept that “everything must change,” as Art Byrne says, is idiosyncratic. Meaning, it depends upon the individual. And the process for finding that CEO is stochastic (i.e. randomly determined). We must overcome the idiosyncratic nature of Lean leadership and its randomness. How do we do it? Look here for clues. Hi Bob. You can add another reason for the failure of lean. I have observed business owners, or the so called lean leaders within a company, pick and choose just certain elements of lean and almost have tunnel vision over just that one or two elements. One of the more recent ones has almost totally focused on Kaizen to the point of even selling “Kaizen Foam” as if it is the magic bullet to solve everything. One of the greatest failures is when the company does not do lean but just one department. I observed one where there were great gains in manufacturing and they still took 3 years to develop a product and required 13 signatures to process a change order. Hi Bob – The book thoroughly explain why execs pick and choose certain Lean tools, and otherwise try to fashion Lean to their liking. That fact that even that does not deliver much in the way of results is immaterial because execs are not actually looking for much in the way of results from Lean. The trouble with the Lean Movement is that they have become a large part of the problem. Lean is happy to be a “Cleaner Fish” hanging on to its corporate hosts in whatever direction the host wants to go. They both get a mutual benefit but their is no change in direction or purpose, just a nice comfortable order of things. Hi Steve – I like your “cleaner fish” analogy. Indeed, there is “no change in direction or purpose” for most corporations.